The Space Shuttle Challenger disaster was probably the most significant event, in terms of its impact on the US space program, in the history of spaceflight. On the bitter cold morning of January 28th 1986, seven astronauts on-board Space Shuttle Challenger lost their lives in front of family, friends, and millions of TV viewers. The vehicle broke up 73 seconds into the flight, burning nearly 2 million liters of fuel in just a few seconds that created a sinister cloud of gas. Challenger’s fateful mission – flight number STS-51-L – was a unique mission. 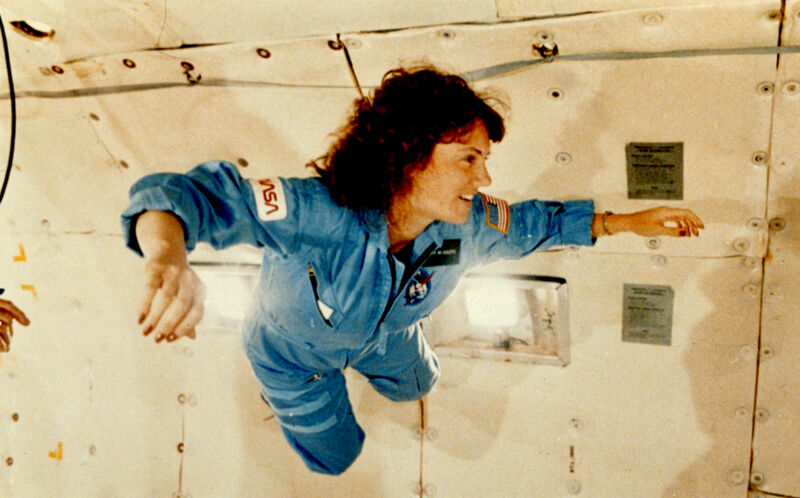 Among the crew there was Christa McAuliffe, the first civilian astronaut. McAulliffe was a teacher selected out of 11000 applicants under a new program called the Teacher in Space Project. This initiative was intended to inspire students and to sustain public interest in the over-budgeted shuttle program. The launch was originally planned for January 20th, 1986. Delayed several times due to technical problems and bad weather, it finally took place on its 7th attempt. In the two and half years since its debut, Challenger had transported 51 astronauts in nine trouble-free flights. Right after lift-off, at 11:38 AM (EST) none of the flight parameter indicated any trouble with the vehicle. Lift-off and re-entry are the most critical phases in a Space Shuttle’s flight, and challenger successfully passed through the first one. The crowd was amused with the launch; none of them anticipated that challenger was on its way to a fateful journey. About 58 seconds into the flight, Challenger entered into its Max-Q, a point where the aerodynamic forces on the vehicle are at their maximum. The flight director ordered to slow down the engines to keep aerodynamic forces within safe limits. Although the Shuttle successfully made it through Max Q point, it was later found that this phase played an important role in the disaster. At 73 seconds Challenger broke apart over Atlantic Ocean. 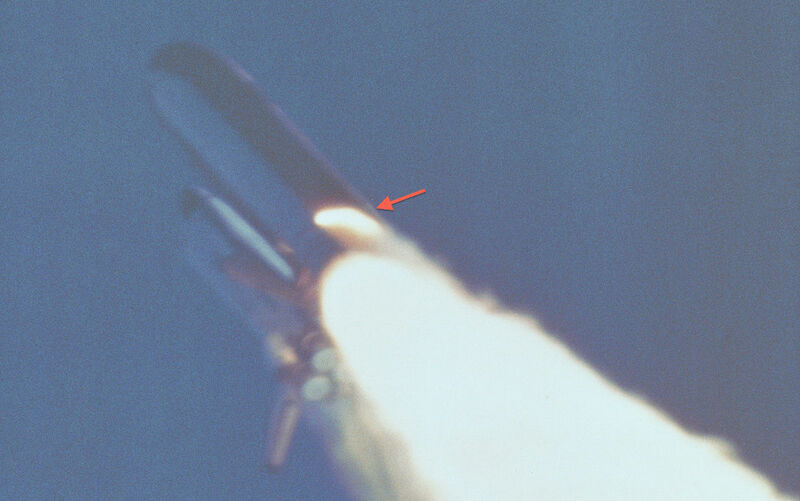 The disintegration began with the failure of an O-ring seal in the right Solid Rocket Booster (SRB) that let a plume of hot gases break through. This plume, acting as a blowtorch, pierced a hole in the wall of the External Tank. The dome of liquid hydrogen failed and crashed into the liquid oxygen tank, causing a release of fuel that conflagrated. The Orbiter did not explode: it was torn apart by abnormal aerodynamic forces. Crew compartment, on the other hand, remained intact and fell, reaching a speed of about 333 km/h at the time of impact with sea. The investigation discovered a disturbing detail: at least three astronauts were alive right after the blast, as three Personal Egress Air Packs were recovered activated. While the fate of the crew during free fall is unknown, impact with the ocean certainly sealed their fate. A presidential commission led by former attorney general William P. Rogers was formed to investigate the disaster. After several months long investigation commission published a report, indicating O-Ring sealing joint failure in the right SRB as the primary reason of the disaster. Due to the cold weather the O-Ring didn’t expand to keep the seal tight, allowing hot gases to escape. A camera near the launch pad revealed smoke plume coming out of the right SRB at the time of launch. Aluminum oxides from the burned solid propellant sealed the joint temporarily, preventing a disaster on the launch pad. However, the aluminum oxide couldn’t keep the seal thigh, as Challenger passed through severe crosswind and Max Q point when it experience significant aerodynamic loading and vibrations. About 64 seconds into the flight, plume started coming out of the right SRB, which later reached the liquid propellant tank burning nearly 2 million liters of fuel in just a few seconds, disintegrating the Shuttle into pieces. If the aluminum oxide would have kept the seal intact for few extra seconds, the shuttle might have made it to space, escaping the disaster. The disaster could have been avoided. The issues with the O-Rings were well known by the engineering team working on the SRB, but attempts to notify the management had been constantly held back. The phenomenon of abnormal O-Ring erosion had been observed in previous flights. Instead of requesting an investigation, NASA Management ignored the problem and chose instead to increase the tolerance. The night before the launch, NASA had a conference call with Morton Thiokol, manufacturer of the SRB. A group of Morton Thiokol engineers, and in particular Roger Boisjoly, expressed their deep concern about a possible O-ring failure in cold weather and recommended postponing the launch. NASA staff opposed the delay. “My God, Thiokol, When do you want me to launch — next April?” said Lawrence Mulloy, one of the shuttle program manager attending the teleconference. With the pressure from NASA, Thiokol management gave their approval to the launch, and Challenger was on its way to disaster. 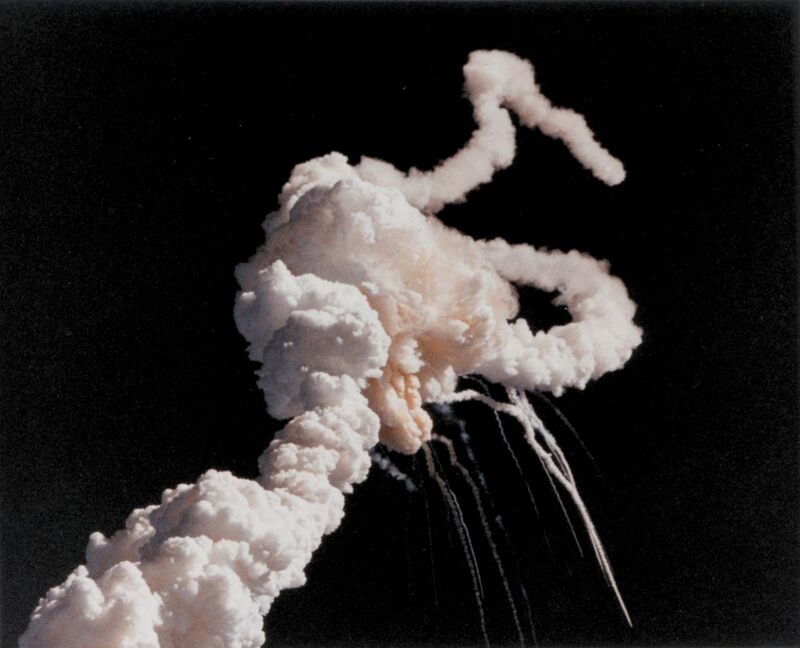 This failure in communication, combined with a management structure that allowed NASA to bypass safety requirements, was the organizational cause of the Challenger disaster. 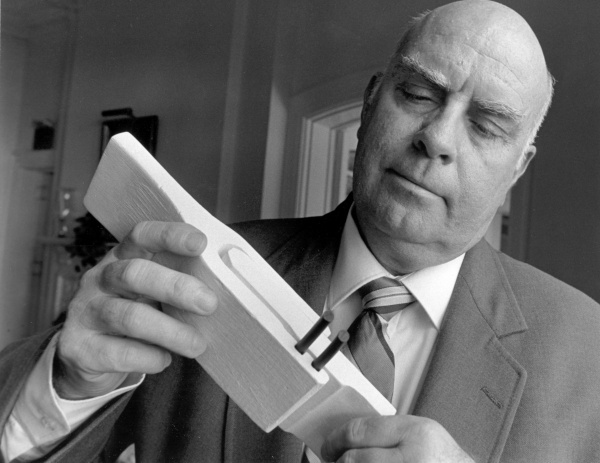 Boisjoly examines a model of the O-Ring at a meeting of senior executives and academic representatives in Rye, New York, Sept. 1991 (Credits: AP Photo). It took 81 days to collect Challenger’s debris from the sea and return them to the Cape. The Shuttle program was grounded for almost three years, until a number of technical and management changes were implemented for safe operation of shuttle. The biggest challenge for NASA was to win back America’s confidence in the Shuttle program. Despite the technical and management changes that followed Challenger, the Columbia disaster in year 2003 proved that the Shuttle was a complex and unsafe machine, whose reliability depended on too many variable to be managed in a cost-effective manner. The Space Shuttle was retired in year 2011 after 135 missions. Despite the two tragedies that marked its history, the Space Shuttle program will always be remembered for the marvelous contribution it gave to the advancement of the US space program. Is English the author’s first language? Did anybody bother to proofread this?